(2) Aggravated Assaults, (1) Robbery, (2) Residential Burglaries, (2) Commercial Burglaries, (7) Vehicle Burglaries, (1) Theft from an Unlocked Vehicle, (3) Grand Thefts and (4) Petty Thefts. On Friday, 02/24/2013, an aggravated assault occurred near the 27500 block of Bernina Avenue. Roommates were engaged in an altercation that became physical. The suspect punched and slammed the victim’s head into several walls. The suspect was arrested yesterday, 02/27/2013, by deputies from the Crime Impact Team. A robbery occurred near the 27500 block of Whites Canyon Road on Sunday, 02/24/2013, at approximately 3:30 p.m. The victim was approached by three Hispanic male gang members who produced a firearm and demanded all of his property. The victim complied and the suspects fled shortly after. Later that same day a follow up investigation by proactive deputies led to the arrest of the primary suspect. Gang enhancements and the use of a firearm in the commission of a crime will land this suspect behind bars for a considerable amount of time if convicted. 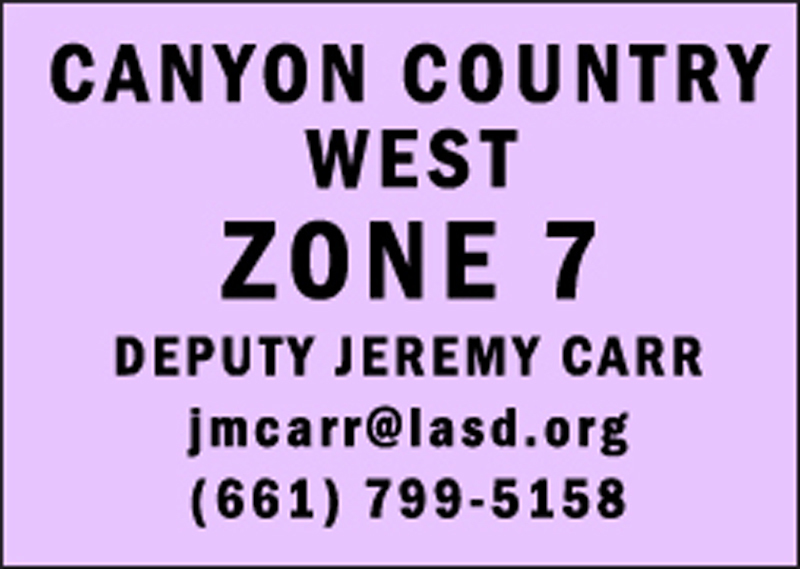 A residential burglary occurred near the 27800 block of Camp Plenty Road. An unknown suspect took tools from the victim’s open garage. On Wednesday, 02/20/2013, a commercial burglary occurred near the 26900 block of Rainbow Glen Drive. Deputies were in the area looking for a domestic violence suspect (who happened to be the same suspect in this incident) when they observed the suspect exiting the location through the shattered glass door, carrying a computer. When the suspect saw the deputies, he immediately took off running. After a foot pursuit and substantial containment, the suspect was located by responding deputies. The suspect fled to the roof of a nearby house and was arrested by deputies. On Wednesday, 02/20/2013, six vehicle burglaries occurred from two separate fitness center parking lots. Three incidents occurred at the LA Fitness located at 26455 Golden Valley Road and three occurred at the Fitness Compound located at 18655 Soledad Canyon Road. All six incidents occurred between the hours of 6:30 p.m. and 9:00 p.m. and all involved purses being left in the vehicle in plain view. We must reiterate the fact that it is important to remember not leave your personal items out in the open when parking your vehicle ANYWHERE. It is an invitation for criminals to invade your personal space. Please do not make it easy for these guys. I encourage you to advise family and friends to do so as well. As always, please call me if you have any questions.